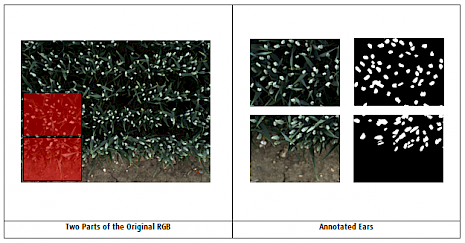 An RGB image showing wheat was divided into 9 parts and annotated. Two parts were used to train a classification algorithm to detect areas of ears using texture features only. The other seven parts were classified using the trained algorithm and the result was compared to the human annotated ground truth. The classifier was correct in 99,3% of the samples.